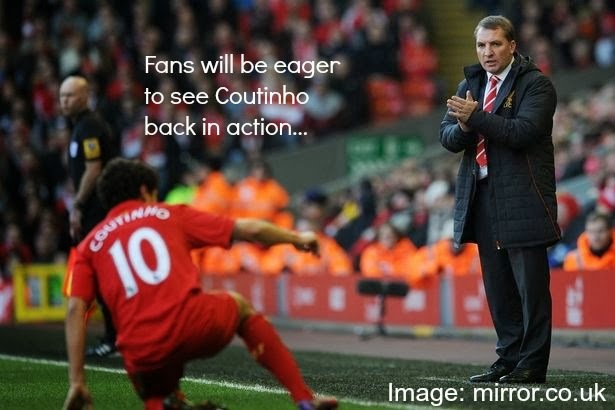 Liverpool are off down South on Saturday evening as they prepare to face rivals Arsenal. The Reds have had a far better start to the season than anyone expected and I think it's fair to say so too have Arsene Wenger's side. Arsenal are currently top of the pile on 22 points with both Chelsea and ourselves tightly behind them on 20 points. A win for Liverpool on Saturday night could put them in a position where they are top of the league and also in control. Injuries for Liverpool mean they are still without Iago Aspas and Sebastian Coates. The positive for Brendan Rodgers though is that he should be able to call upon both Jose Enrique (late fitness test) and Philippe Coutinho. A prospect that many fans are excited by. For Arsenal they have some big names missing in Flamini, Podolski and Walcott. Reports suggest those three won't make the fitness grade in time for kick off and also unavailable for Arsenal are Diaby and Oxlade-Chamberlain. Liverpool are in London on Wednesday evening preparing to face Arsenal and hoping to put behind them their League Cup loss. After losing to Oldham in the FA Cup this weekend the Reds have had their pride knocked a bit, if they can pull off a result at the Emirates though they may be able to recoup some bragging rights this week. Thankfully for Liverpool the injury situation is looking a lot better. Glen Johnson, Jose Enrique and Pepe Reina should all be available to start on Wednesday . For Arsenal they are without ex Everton man Mikel Arteta, Fabianski and Coquelin who are all still recovering from injuries. Also unavailable is Gervinho who is at the African Cup Of Nations. The last time Liverpool and Arsenal met was in September last year. The match at Anfield ended badly for Liverpool who succumbed to a 2-0 defeat. Our last visit to the Emirates though makes for more positive reading, in August 2011 Liverpool won the match 2-0 after an own goal and a Luis Suarez effort.